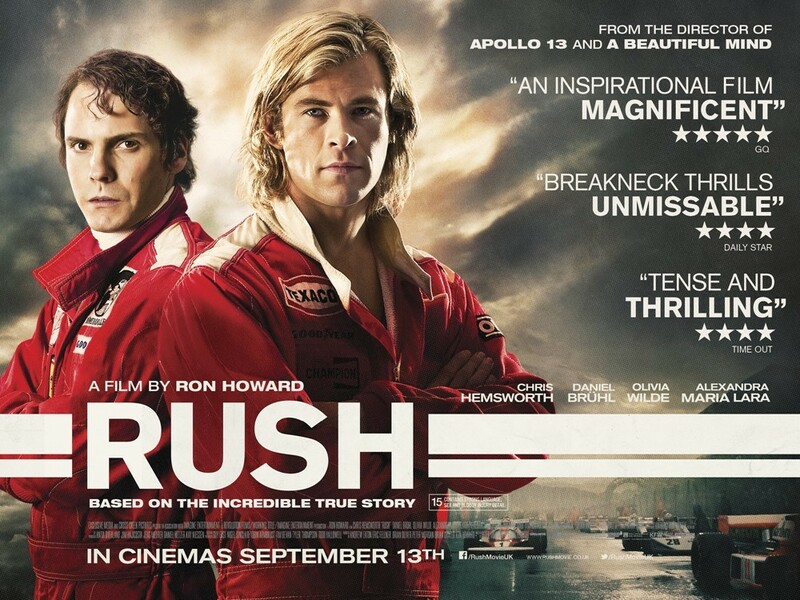 Brief Synopsis – Chronicles the racing rivalry between two Formula 1 drivers in the 1970’s. My Take on it – With Ron Howard’s movies, I have always had mixed feelings. Some were great [Apollo 13 (1995), Parenthood (1989), Backdraft (1991) and Ransom (1996)], some were ok [A Beautiful Mind (2001), The Paper (1993) and Splash (1984)] while others were disasters [Grand Theft Auto (1977)], so whenever I sit down to watch one of his movies, I never know what to expect. I had heard mixed reviews about his latest endeavor which chronicles the true story of the rivalry between Formula 1 racers Niki Lauda and James Hunt during the 1976 racing season. I thoroughly enjoyed this movie because of the way it shows the arrogant natures of these rivals in different ways. They both live their lives and race in the same manner. One is cautious in everything he does, including personal relationship and whether to endanger himself during a race due to inclement weather and the other throws caution in the wind and sleeps with any woman he can and is willing to risk everything in order to win a race no matter the danger. The camera shots during the races themselves are amazing and breathtaking. As good as this movie is, it still didn’t captivate me as much as Apollo 13 (1995), so I cannot say that this is Howard’s best film, but it definitely is one of his best. Bottom Line – Great portrayal of arrogant rivals with different outlooks on life and racing. Very well done character study. Highly recommended! Overall, I agree. I don’t think it as good as many others (including you), but I do think it above average and always entertaining. I actually thought it was mostly average during the first half, but the drama and action in the second half raised my opinion of it. I’ve been wanting to see this one! I have yet to see Mr. Hemsworth in a serious role, so I feel like I should check it out. Nice review! Oooh I forgot about that! It’s such a brief role! Cara! You have to see Rush! I looooooved it. And Hemsworth is amazing. 🙂 And I hate racing and all sports! Glad you enjoyed it, Rob. 🙂 It’s my favorite Ron Howard movie ever and very high on the top ten 2013 movie list I’ll do soon.